Wappo is an indigenous language, generally regarded as a language isolate, which was once spoken in the Russian River Valley, just north of San Francisco, California. 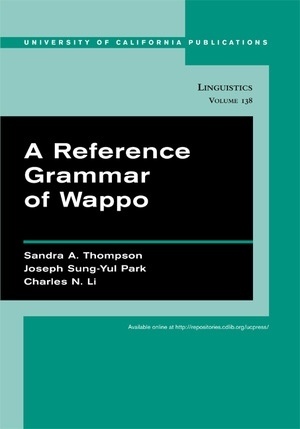 This reference grammar is based on the speech of Laura Fish Somersal, its last fluent speaker, who died in 1990, and represents the most extensive data and grammatical research ever done on this language. The grammar focuses on morphosyntax, particularly nominal, verbal, and clausal structures and clause combining patterns, from a functional/typological perspective. Sandra A. Thompson and Charles N. Li are Professors of Linguistics at the University of California at Santa Barbara. Joseph Sung-Yul Park is an Assistant Professor of English at the National University of Singapore.